Story: Daniel Dareus is a successful international conductor at the top of his game, but he is lonely, miserable and exhausted by the demands of his high profile life style. 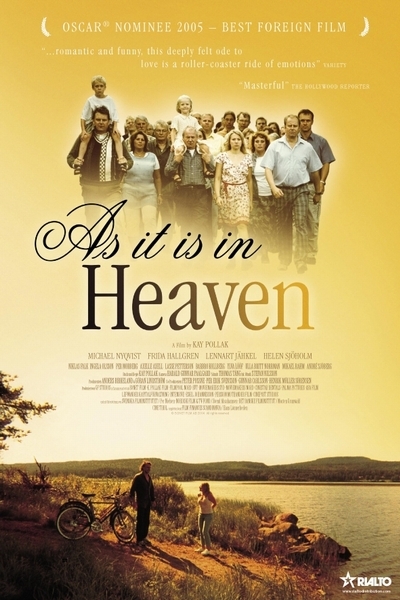 After suffering a physical and emotional breakdown, Daniel abruptly interrupts his career and returns, alone, to Norrland, the village of his childhood located in a remote part of northern Sweden. Immediately upon his arrival his fame makes him the object of curiosity, fascination and suspicion. Soon he is asked to come and "offer a bit of good advice" to the small church choir, which practices every Thursday in the parish hall. Daniel resists being dragged back into the spotlight, yet he finds that there is no way he can gracefully refuse the choir's request, and reluctantly he agrees to help. As he begins to work with the choir, Daniel, quite to his own surprise, begins to rediscover his long-lost joy for music. But his work with the choir is a serious threat to the town's status quo, and Daniel finds himself surrounded by enemies, including the jealous parish priest and a dangerous and violent enemy from his past. At the same time he makes new friends, among them the lovely and sensitive Lena, a woman who helps him overcome his fear and loneliness. Daniel's life, and the lives of the people of Norrland, will never be the same.